The good news is that, if they build the NFL stadium in Carson, it will be the single dumbest LA-related idea since I moved here in 2002. An eastbound Expo Line test train on Colorado Avenue in Santa Monica in early November before the temporary fencing was erected. Photo: Steve Hymon/Metro. The city is recommending that fencing be constructed either along sidewalks or between the tracks, which run down the middle of Colorado Avenue between 17th Street and 5th Street. The concern: citing numbers from train testing in October, the report says that “a total of 2,788 incidents of pedestrians, 503 bicyclists, and 153 skateboarders trespassed in the guideway.” That’s a number that includes people crossing against traffic signals and walking across the tracks outside of crosswalks. 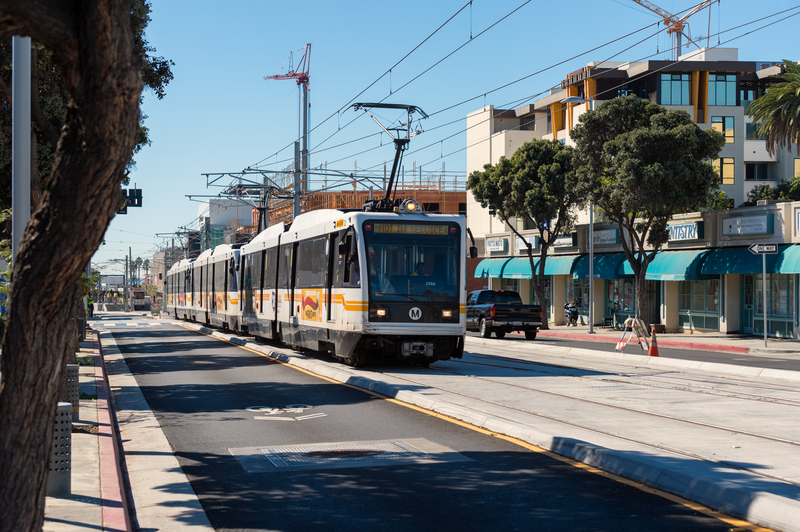 The number of trespassers who are encroaching on the Colorado Avenue guideway is of great concern to Metro, Santa Monica Police, the Santa Monica Fire Department personnel and others knowledgeable about urban light rail transit safety. During train test runs, train operators have observed dangerous behavior on the part of pedestrians. A Metro Light Rail Vehicle requires 200 feet to come to a complete stop (125.7 feet under emergency braking) when traveling at 30 miles per hour under optimum conditions, versus a typical automobile which can stop in 45 feet when traveling at 30 miles per hour. The stopping distance is adversely affected by environmental conditions such as moisture and other factors, including operator response time. Staff does not anticipate that installation of fencing would impact the launch of Expo in Santa Monica. An effort would be made to coordinate train testing and fence installation to reduce impacts on residents. Potential night work may be necessary; however noise would be kept to a minimum. A public notice would be issued to residents, businesses and patrons within the impacted area prior toany work starting. Social media outreach would be conducted as well. In 2011, the City Council sought to minimize obtrusive physical barriers along the Light Rail Line running through our community. As the post notes, Metro recently launched an online survey to ask customers how they use the 22,000-plus spaces at Metro rail and bus stations. As Joe Linton notes, Streetsblog LA (and others, including an APTA peer review of Metro) have been critical of Metro for supplying mostly free parking at its stations. On other hand, riders and officials in the past have said the free parking is an incentive to get motorists out of their cars and on buses and trains. 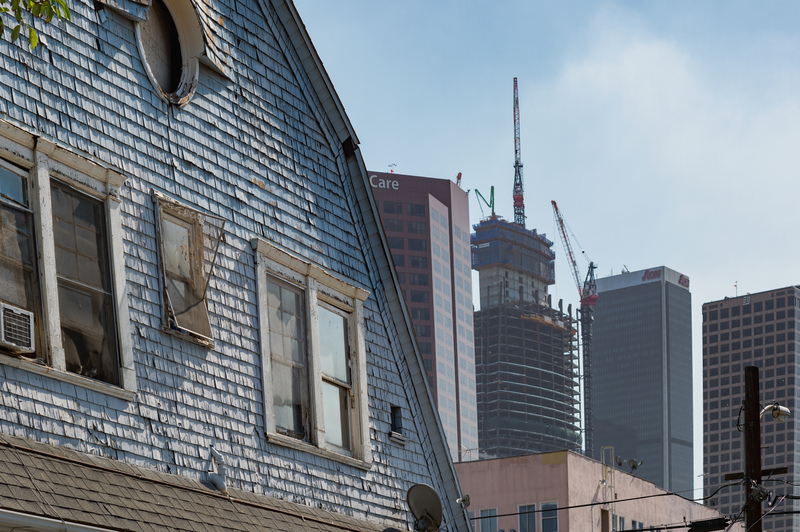 L.A. is changing but the zoning plans for many parts of town haven’t changed in many years. Photo by Steve Hymon. A decade ago, then-Mayor Antonio Villaraigosa announced that the city would be updating the 35 community zoning plans that dictate what is allowed to be built across the city of Los Angeles. To date, according to Zocalo, only three of those plan updates hae been completed, with the one covering Hollywood having been successfully challenged in court and tossed out. A salient story for How We Roll given that the Metro Rail system is expanding, meaning new plans — replacing ones that are decades old — may reconsider what communities near transit look like and where new density and bigger buildings are allowed. In a related story, the city’s planning chief has left and Mayor Eric Garcetti has nominated the city of Pasadena’s planning chief for the job. Also related: we wrote yesterday about a fancy new mixed use development proposed in West L.A. near the new Expo Line Bundy Station. It remains to be seen if it gets built. Back in days of yore when I was a reporter covering the L.A. City Council, I learned that most big new developments in L.A. result in protracted negotiations between Council Members and developers, who often ask for exemptions from the zoning codes. In the first story, the author reports some wrinkles, but overall liked taking a ride-hailing service from LAX. The city of L.A. last month started allowing Lyft to pick up customers at LAX and Uber has applied to do the same. The attraction of Lyft at LAX: it’s cheaper than a traditional taxi and can be summoned via a smart phone app. As attentive Source readers know, we’re still a few years away from LAX having an automated train that whisks passengers from three stations near airport terminals to a new station at Aviation/96th Street on the Crenshaw/LAX Line. That should be more convenient than the present-day bus shuttle to the Green Line’s Aviation Station. First slice of juiciness: a self-driving ride-hailing car presumably gets around the labor issue. Of course, there is a big presumption in that statement: it depends on cities and/or states allowing self-driving cars to ferry people around. As the article notes, the law in California is that all self-driving cars still must have a human behind the wheel. Another thought: a true self-driving car owned by a car manufacturer would be a convenient way around the inconvenient labor issue for ride-hailing companies, eh? Here’s an intriguing question: will the presence of ride-hailing services give pause to city dwellers when faced with decisions about expanding transit? To put it more bluntly, will someone living in a city feel the urgency to support more transit if they come to believe that the best alternative to driving is letting someone else do the driving? I’m really interested in your views on that one, folks. Comment away please. Dr. Zizmor’s ads for clear skin — featuring a rainbow — have been a staple on NYC subway cars for 30-plus years. But the doctor has apparently retired, shuttered his office and plans to spend more time traveling and studying the Talmud, according to the Daily News. Here’s one of his TV ads, perhaps familiar to Source readers who once resided on the Other Coast. Things to read/watch whilst on transit: “someone made an In-N-Out pie and it’s a beautiful, revolting mess,” brought to you by the folks at Buzzfeed. I’m not sure what this says about myself but I found it more beautiful than revolting. Jan. 4: no love of freeways from one big L.A. media outlet and a fancypants new development along the Expo Line. Dec. 23: Lyft to LAX, Star Wars characters on transit. 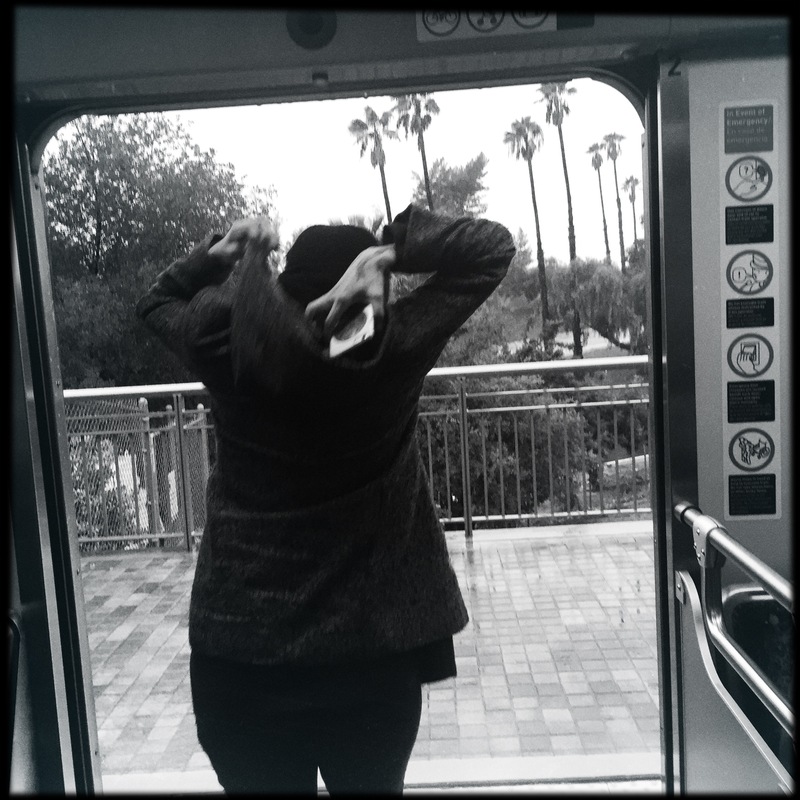 Dec. 21: Silver Line to San Pedro, will there be transit to pro football in L.A.? I’ll state it again. Are those born in the 1960’s and later that stupid that they walk or drive into the path of light rail trains. Perhaps they all need to be fitted with crash helmets to be worn 24/7 since they must be mentally challenged. It’s not like light rail and streetcars are a a new technology, they have been around for over 100 years in one form or another much of it without fencing. Using the logic that fencing is a absolute requirement it would appear San Francisco is a killing zone since fencing virtually does not exist. I don’t know why you guys keep insisting that free parking is the incentive in using Metro. It does NOT! It’s the Metro part that are now attracting riders, not the parking! The spots are all completely full by the time the majority of people use the stations anyway so it’s just a waste of space and money. If you guys really insist on keeping the parking, at least charge for it based on demand so less of Metro’s valuable money is being used to subsidize parking and car use. In Chicago, they even have THIRD RAIL ELECTRIFICATION ON UNFENCED AT-GRADE “L” TRACKS. And yet somehow, they don’t have large numbers of people taking themselves permanently out of the gene pool. The only way I would get into a self-driving vehicle is if it were on a set of fixed rails. The fantasy of self-driving cars solving L.A.’s mobility problems for the majority of people who live here is just that — a fantasy. The proven technologies of rail and bus are ready to go. Let’s fund them and get on with it! I hope Santa Monica could include something like the have at the Expo/Blue downtown. The terrible thing about public transit is that it usually takes something to happen for people to learn. Santa Monica is ahead of the curve, and will install something nice I’ll bet. As much education as you give people about trains, they are still going to do what they want anyhow. Just today there was a crash on the Blue Line with someone trying to beat the train. How stupid can people be. As far as a driverless car like Lyft or Uber; personally with the traffic we have in LA, I would not want to ride in a car like that. The self driving cars by Google and others aren’t funded by taxes, they are researched and run by private companies. So why would anyone care if they’re doing them out of their own pockets? The best thing is to have multiple options to get around. If people have a choice with buses, rail, and self driving cars, then it’s three different choices to get around and everyone benefits with lower prices through competition. Monopoly is bad, competition is good. I don’t discourage Google or anyone else from researching self-driving cars, and I do think there will be special applications for the technology, such as for the blind, the elderly or the otherwise infirm. My biggest problem with the current self-driving car mania is two-fold: First, it will only make traffic worse, as the technology will help us to become more tolerant of bigger traffic delays. And second, it feeds into that long-established anti-urban, anti-government and anti-tax hysteria that believes we should entrust our public policy to the forces of free-market capitalism. Repeating simplistic mantras about monopolies and competition only goes to demonstrate the unwillingness of some to learn from the devastating consequences of our decision last century to let the car manufacturers and their energy friends destroy our cities. And anyway, who do you think paid for all that infrastructure for the private automobile? We did!